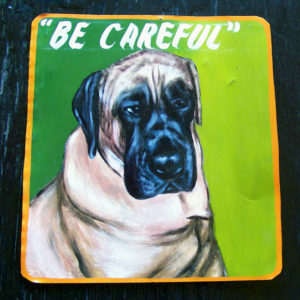 View cart “Great Dane folk art Pup by Hari P” has been added to your cart. 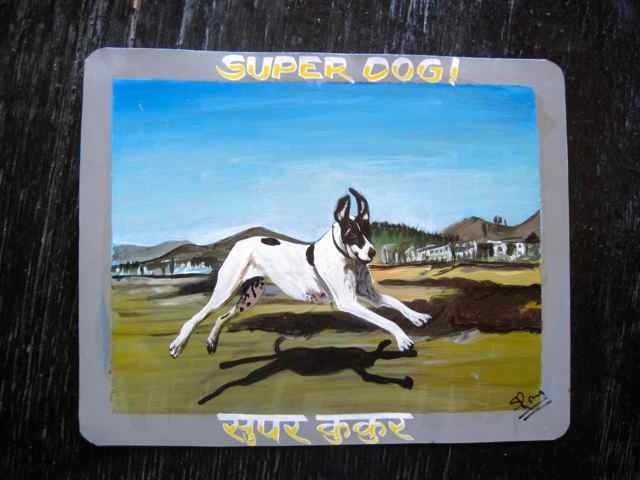 Sanjib Rana hand painted the Flying Otis Super Dog using acrylic paint. 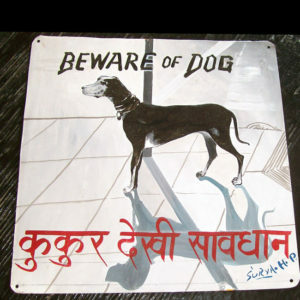 He let his young daughter hand paint the shadow under the handsome Great Dane. 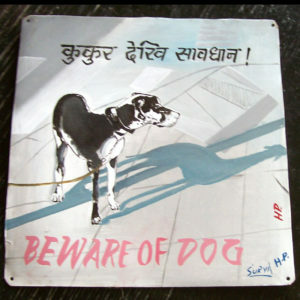 Folk art “beware of Great Dane” sign hand painted on metal in Nepal. This pup was 5 months old at the time. This handsome 5-month old puppy was spotted on the streets of Santa Monica. I couldn’t resist taking his photo and giving it to Hari Prasad. 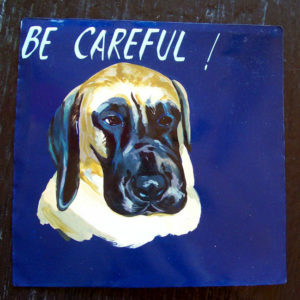 Agatha the Great Dane, this time by Nara of Asha Arts, with his signature dark blue background. 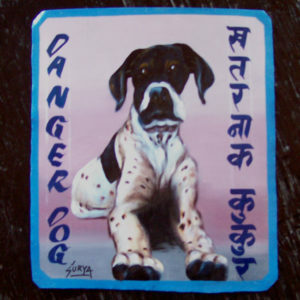 This portrait of a Great Dane was painted by Sagar. 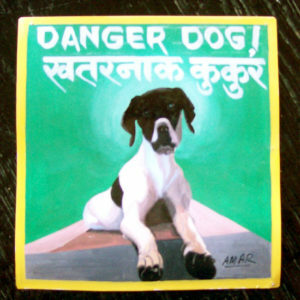 Not a commissioned piece, I was thrilled when I noticed this painting in the back of his studio. Even better was that it was for sale. This huge Great Dane was spotted on the Santa Monica Prominade. Notice the head of the man figure. The photo did not include the man’s head and this is the result! 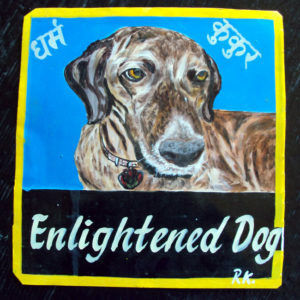 Folk art portrait of a handsome Great Dane puppy hand painted on metal by Hari P.
This portrait of a Great Dane was painted by Sagar. Not a commissioned piece, I was thrilled when I noticed this painting in the back of his studio. Even better was that it was for sale. 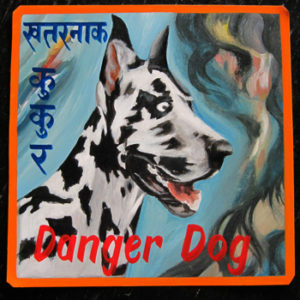 This is a nice cartoon version of a Harlequin Great Dane. 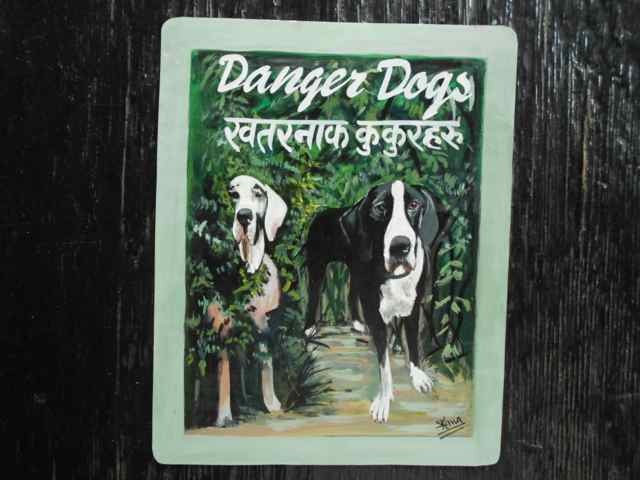 Sanjib Rana hand painted this folk art portrait of Judah and Hank the Great Danes on metal. This was done from a composite of two photos. 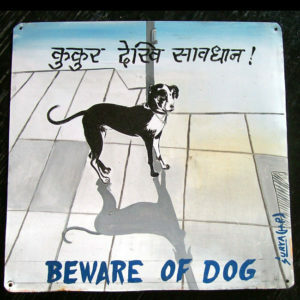 The sign is 12″x15″. Raaz Rai was a young art student currently attending university in Kathmandu when we first met. 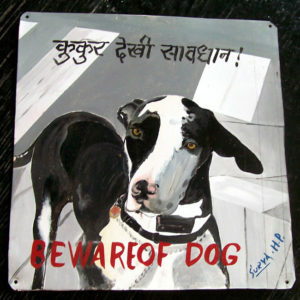 He was working out of Karma’s studio near Boudha. In 2012, I met him again. 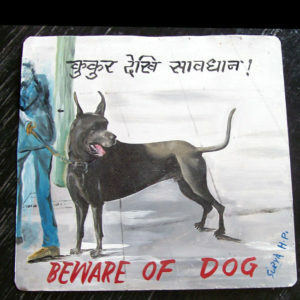 He had graduated from University and was teaching art at the Kathmandu University. But in early 2013, he planned to go to South Korea to work as he will make more money as an itinerant worker than as an art teacher. 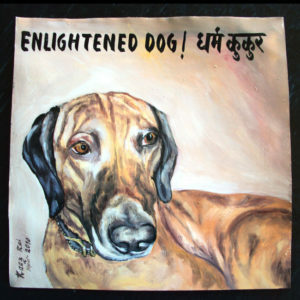 Sagar's colorful take on the brindle Great Dane Mr Deeds.